Seen here approaching berth at the Port of Vancouver’s Deltaport Container Terminal in October 2016 is the 10,062 TEU capacity ZIM Antwerp. Opened in 1997 and located adjacent to the Westshore Coal Terminal, Deltaport is operated by Global Container Terminals under lease from the Vancouver Fraser Port Authority. At 210 acres, this is Canada’s largest container terminal and comprises 1,100m of quay and eight rail tracks totaling 28,000 feet. Super post-Panamax cranes, some of which are tandem lift, enable the handling of the largest ships currently in service between Asia and the West Coast of North America. ZIM Antwerp made a small piece if history in June this year when she was the first Ultra Large Container Vessel (ULCV) to pass under the newly raised Bayonne Bridge (picture above center) when calling at Maher terminals in the port of New York and New Jersey. A plaque was made to commemorate the event and presented to the vessel’s Master (above right). 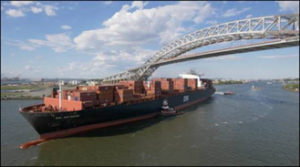 With the raising of the bridge to provide an air draft of 65.5m, vessels of up to 18,000 TEU can now access three of the four main terminals of the port of NY/NJ – Maher Terminals and APM Terminals in Elizabeth NJ and Port Newark Container Terminal in Newark. Previously, ships over 9,500 TEU could be handled only at the GCT Bayonne terminal. The project cost to raise the bridge was $1.6 billion which was seen as an essential investment if the port complex was to benefit from the expanded Panama Canal. 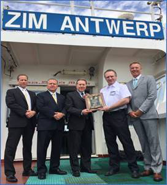 For its part, the history of Zim Line goes back to the birth of Israel in the late 1940s when the company played a significant role in support of the new nation. The company acquired its first ship in 1947, the early fleet being primarily established to carry cargoes and immigrants from Europe in the immediate aftermath of World War II. 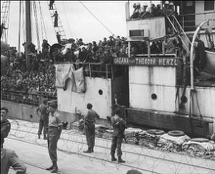 The picture above left is of the small coastal trader SS Theodor Herzl crammed with 2641 immigrants on arrival in Haifa after several attempts by the Royal Navy to stop her. The company expanded rapidly during the 1950’s and 60’s. 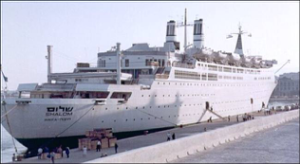 Above center is the 1959 built SS Jerusalem and above right is the 1964 built SS Shalom (meaning peace) which was purpose built to offer a dedicated Transatlantic service from Haifa to New York. On delivery, she was dedicated by Mrs Paula Ben Gurion, the wife of Israel’s first Prime Minister, Mr David Ben Gurion (1886-1973). 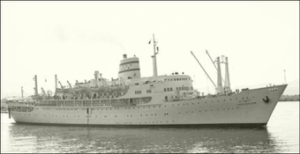 SS Shalom went on to have several lives as SS Hanseatic, SS Doric, SS Royal Odyssey and finally SS Regent Sun. By the time of the company’s 25th anniversary in 1970, the fleet comprised 77 owned ships and 70 chartered ships operating 19 major services hauling more than 4 million tons of cargo annually. In common with many other traditional liner operators and with the company now largely in private hands, the 1970’s witnessed an aggressive expansion into container shipping. The name “ZIM” was proposed by Israel’s first Minister of Transportation, Mr. David Remez. 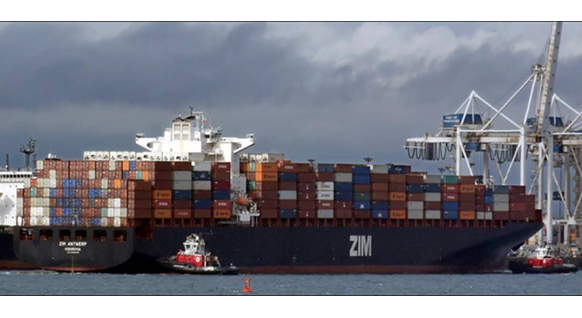 The name is based on a passage in the Bible in which the Hebrew word ZIM refers to “large vessels” and reflects the goals of the company, even in its earliest days, to build a large fleet.